The Armed Services Vocational Aptitude Battery (ASVAB) comes in many flavors, depending on where you take it and the primary purpose you are taking the test. The questions are the same no matter what version you take, with one exception. The Assembling Objects (AO) subtest is not included on any of the paper versions of the ASVAB; it's only included on the computerized version. This is a paper version of the test. This "High School Version" is officially called "Form 18/19." It's commonly given to juniors and seniors in high school through a cooperative program between the Department of Defense and the Department of Education. The test is offered at more than 13,000 high schools and post-secondary schools in the United States. Approximately 900,000 students take Form 18/19 ASVAB each year. The primary purpose of this test is not for enlistment in the military, but rather to help high school guidance counselors to counsel students about what career areas they have an aptitude in. 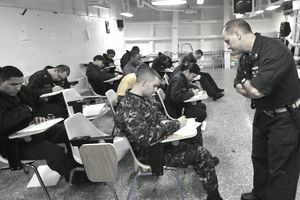 The high school version can also be used to qualify for enlistment, however, as long as the student has achieved a qualifying AFQT score, and as long as the test is taken within two years of enlistment. The computerized version of the ASVAB is given at Military Entrance Processing Stations (MEPS), throughout the United States. Your recruiter schedules the test, in conjunction with your enlistment processing. More than 90 percent of those who take the ASVAB for the purposes of enlisting in the US Military take the CAT-ASVAB. The software is "adaptive," in that it presents you with questions according to your ability. The first question is of average difficulty. If you get that question right, the next question will be harder. If you get it wrong, the next question will be easier. Why is this an advantage? Because difficult ASVAB questions are worth more points than easier ASVAB questions. If you're really good in a particular subject area, you can get all of the hard questions out of the way first (those that are worth the most points), thereby maximizing your score. On the paper ASVAB, the hard and easy questions are randomly mixed. Among those who have taken both the paper version and the computerized version, most find they score slightly higher on the computerized version. There is also a paper version of the ASVAB used for recruiting purposes. The paper version of the ASVAB used for military recruiting is officially known as "Forms 20-22." This version is given by the Armed Forces for enlistment purposes only. While the questions on the high school version and the recruiting version are different, they are equal in difficulty. Few people take the paper recruiting version of the ASVAB these days because most folks interested in joining the military take the computerized version of the ASVAB at the MEPS. Usually, the paper recruiting version is given when it is impractical for the applicant to travel to MEPS. The test is administered by traveling MEPS teams, usually at a local National Guard barracks. This is officially called the Armed Forces Classification Test (AFCT). It is exactly the same as the paper version of the ASVAB. It's taken by those who are already in the military, who may wish to re-take the ASVAB in order to qualify for re-training into a different military job. There is sort of a “mini-AFQT” you may take in the recruiter’s office. This test is called the Computer Adaptive Screening Test, or CAST. Another version in use is called the Enlistment Screening Test, or EST. The EST and CAST are not qualification tests; they are strictly recruiting tools. Scores on these two tests do not qualify you for enlistment. These tests are management screening tools that may be administered at the discretion of the recruiter. The EST and CAST contain questions similar to, but not identical with, questions appearing on the ASVAB. They are used to help estimate your probability of obtaining a qualifying AFQT score. If you take one of these "mini-tests" and score low, you probably don't want to take the actual ASVAB until you've put in some extensive study-time. In fact, many recruiters won’t even schedule you for the ASVAB, unless you score well on the EST or CAST.